I thought it was about time I showed an update on the Stripy crochet blanket, it feels like I've been talking about it forever. I actually checked though and I started it on the 25th of January, so its not being going on for as long as I thought. 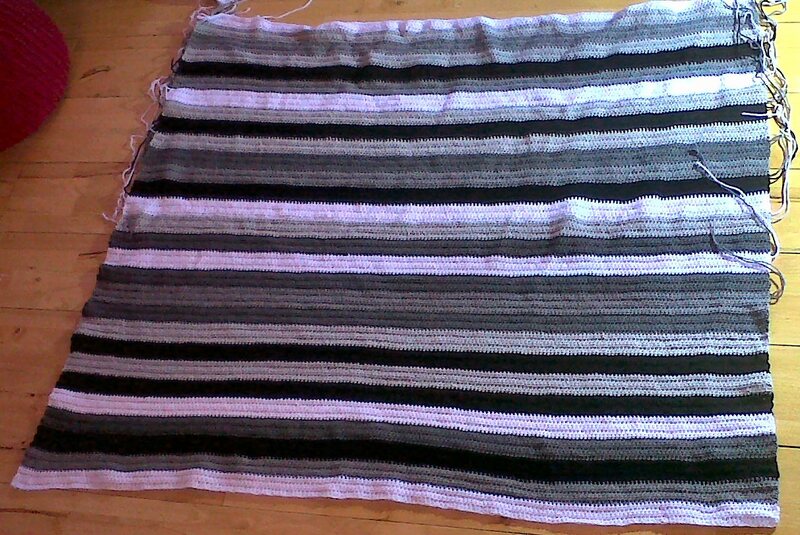 I've worked out that I need to crochet 60 of the wide stripes before I put on a border. I'm working out the size off a grey throw that is in constant use in our living room and is a nice size. Each wide stripe is 5 rows of crochet so that should work out at 300 actual crochet rows altogether, which doesn't really sound that much. I am on the 29th stripe (technically the 30th one I crocheted as I had to undo one, but I'm trying to forget that). So I really am nearly half way through. Of course I have to do the border as well and I know that is going to take longer to do than a stripe or two but hopefully by that point the fact that I am so near the end will spur me on. This isn't necessarily always the case, I have had far too many projects lingering in my WIP basket waiting for a sleeve to be sewn up or some buttons sewn on. I always enjoy starting a project far more than finishing one off. Not bad I think for 18 days work, it averages out at more than a stripe a day, and as some days I haven't actually picked it up I think actually I am closer to two stripes a day. Although I do keep getting tempted to start one in my colourful Stylecraft special DK. I am trying to be good and only do one at once but I['m not sure how long my resolve will hold out for. This year is definitely going to be the year of the blanket though if my current project plans are anything to go by.